This is the second #2014bloggerchallenge I am sorry it is late, but I just been so busy the past few days. I have to be honest, I’m not good at keeping my Skin Care up, which I know is bad. 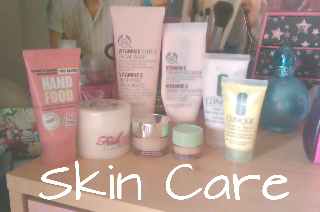 I don’t really use that much on my skin, plus I don’t find I need to. I am lucky in that I don’t get spots, although I do get red skin and I have very sensitive skin, which means finding products is hard. The Body Shop Vitamin E Gentle Facial Wash £8.00 – Amazing at removing all makeup including mascara. The Body Shop Vitamin E Cream Exfoliator £9.00 – Gentle on skin, removes any dry skin on face. Soap & Glory The Fab Pore Facial Peel £10.00 – I find it leaves my skin soft and fully clean, Love this Face Peel. Clinique Dramatically Different Moisturizing Lotion £17.00 – Locks in moisture, I use this everyday on any dry areas of my face, and it works perfectly. Clinique Moisture Surge Extended Thirst Relief £32.00 – I have never found a surge that is better than this, I could go on and on about how amazing it is. I think it is a must have if you have dry skin. Clinique All About Eyes £25.00 – I find this brightens my eyes, reduces circles around my eyes. Hand Food £2.50 – Love Love Love, if you have read my Favourites post then you would have seen, that included it a few times, It’s my must have. The Body shop Mango Body Butter £5.00 – I love this body butter again a must have for winter. I still need to write mine! Skin care is not something I enjoy at all!! I've been toying with buying the Clinique moisture surge extended relief for a few weeks now, but think I'll buy it after hearing that you love it. My skin is so dry at the minute.